In the summer of 1862, the War Between the States raged through Northern Virginia. The powers of loyalty and survival draw Salina Hastings into the service of a network of civilian spies organized by her father, a Confederate captain and spy. 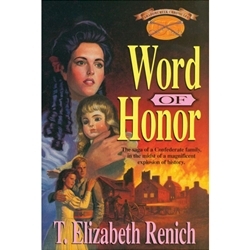 With distinctive historical accuracy based on years of research both on and off site, skilled storyteller T. Elizabeth Renich brings to life the Civil War and a Confederate family's determined struggle for survival in the midst of this magnificent explosion of history. Set against crucial battles and raids and intriguing lesser-known aspects of the War between the States, the Shadowcreek Chronicles are relentless in their passion for history and story.